Image Size: 532mm x 508mm (image size does not include paper border, mount and frame). Format: Giclée Print, [ed. size 950] on 310gsm thick 100% cotton rag. Hand-numbered and hand-embossed. Price: £225.00. Printed to the original size. 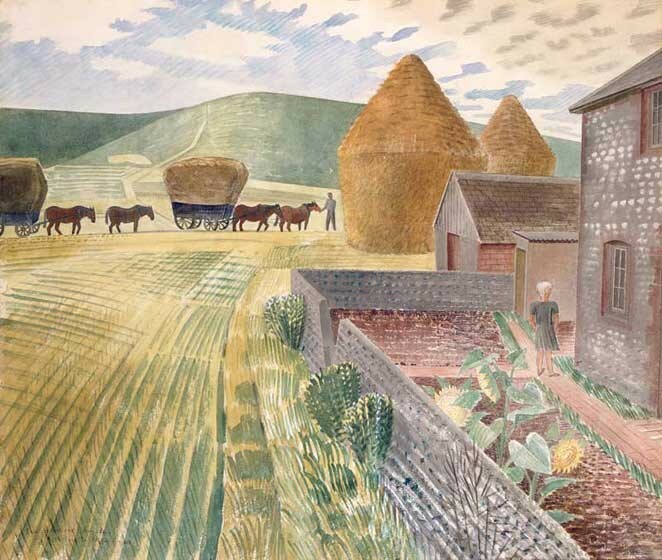 From a watercolour, 'Furlongs' 1934, Ravilious often painted at Furlongs, the home of artist Peggy Angus. This was one of Ravilious's early paintings of Furlongs, painted in 1934. The ploughman in the distance lived in the cottage next door.